Giovanna and I met in a very social network-y way. Tara Hunt (aka @missrogue) tweeted a link to my blog post Guys talking to guys who talk about guys. Cindy saw it, left a comment, and we connected via Twitter and Facebook and Skype. I was immediately struck by IWRTW’s colors and inviting user experience, so different from everything I see out there. Cindy calls it “emotional software” and the first thing I thought of was work that Karen Fries and Tim Skelly did in the 1990s on Seductive interfaces. When I asked how people were using the site she knew just who I should talk to. “Giovanna instinctively got the whole concept of Action Branding that we’ve built into IfWeRanTheWorld — you self-identify and self-express as ‘You are what you do’,” Cindy told me. 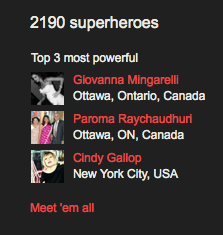 “She’s brought her entire network and family on board, including her grandmother!” So it’s no surprise Giovanna’s at the top of the list of the site’s ‘superheroes’, a classic example of a power user: somebody who knows how to use the site maybe even better than the people who wrote it. She uses IWRTW for a lot of other things too. Here’s her activity stream, with purple for microactions in play, yellow for action platforms, and orange for microactions that are all about execution. Giovanna works with Equal Voice in Ottawa, a multi-partisan organization dedicated to electing more women in Canada. It is the only organization of its kind in the country that is supported by all five of Canada’s national parties. [Cool! Do we have anything like that in the US?] And that was actually the reason why she came to IWRTW. “It can transform politics,” she says. Maybe so. In Ottawa, Oni Joseph (aka the Haitian Sensation) is the first to give it a try. * Rachel Botsman’s excellent interview in Shareable, Robert Rosenthal’s Q&A with Cindy on Bookmarks, and Eliot Van Buskiri’s Yes, We Plan in Wired have a lot more about If We Ran the World. Thanks to Greg, Giovanna, and Cindy for feedback on the earlier draft, and to Oonie for the help with the graphics! I get chills when I think of the potential of If We Ran the World. It’s a search-engine for actions, as the women who empower say. This thing can provide total transparency, concrete goal-setting, and a forum for the world’s most innovative people to connect and bounce ideas around. I am so excited to see where IWRTW goes from here. I hope it continues to grow and will eventually change the way politics, corporations, and individuals operate. Bravo ladies. Keep it up.